Whoohooo! 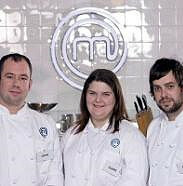 Congratulations to the amazing Claire Lara on winning Professional Masterchef this evening. Right from the first round she was in a class of her own, and it was an absolute thrill to see her win the competition tonight. The other two were brilliant as well, but Claire was extra special. Great kudos to Trekmates! Yesterday I stumbled across a fantastic offer on their website: their Amphibian Gore-Tex Shell Socks (only available in small) reduced from £29.99 to £9.99 per pair. They’ve been discontinued, apparently, but since I’m not very fond of Sealskinz (they’re bulky, they seem to spring leaks quickly and I find it virtually impossible to dry them in the tent) I decided to give the Amphibians a try. I ordered two pairs yesterday afternoon at about 1.45pm, and they arrived this morning with the postman! When I asked, on ringing yesterday afternoon to check that the socks were in stock, how long they were likely to take to arrive, I was told that they’d probably come this morning if the dispatch man was as quick as he usually is, so it sounds as though this level of service may be typical for them. I’ve not bought from Trekmates before, but I’d be very happy to do so again. Incidentally, Trekmates describe ‘small’ as being sizes 6-7. I have size 7 feet in most walking shoes, and I found the socks slightly large, so anyone out there with size 8s who may be wondering whether or not to give them a go may just be in luck. I plan to use them with my trail shoes on wet days. I’m also delighted to see what I think must be the third series of Masterchef: The Professionals well underway. My money’s been on Claire the Scouser from the start, and I wiped away a small tear of joy and relief to see her win her place in the Finals, which start next week. I was sorry to see young Alice go–a closely fought battle, and I felt she was a bit unlucky to lose it–but I’m sure she’ll do well, whatever she does next. Piglet continues to thrive, along with Puss-Puss. I’ve promised her a run in the woods a little later, but I suppose we’d better get a move on if we’re not going to be stuck out in the dark again, as we were a couple of days ago. It’s hard enough to keep track of Piglet’s rabbit-chasing antics in daylight, and virtually impossible after about 6pm, now that the days have begun to close in. Here’s something I’ve not listened to for ages. I used to do a lot of running to this song, and listening to it now brings back an echo of pre-race tummy butterflies. Or then there’s this version! I’m watching a US foody prog called Top Chef: Masters (it’s on the Food Channel), and one of the judges is an American food critic called James Oseland. Is it something about people who look like this, d’you think? That odd way of torturing their voooWells?? Something to do with the shape of their mouths, perhaps? Possibly they’ve eaten too many scrummy meals. Maybe I’d better watch oooot! Well, this series has finally dragged itself to a conclusion, and The Winkers won. Ludicrous as it seems for RB and his partners to have chosen a team that doesn’t include a cook, I have to say I think it was the right decision between the two couples they’d left themselves with. Chris was a good cook, but I’ve already made my feelings about Nathan clear i.e. lazy, rude, careless. I think it would be madness to embark upon a business venture with him. The Winkers, on the other hand, are at least keen and inventive and they don’t give up (what a save with the cocktail, after the disaster with the souffle! ), and they undoubtedly have spark and some charm. If the restaurant doesn’t work out then I’ve no doubt that it would be possible to convert it into something the Winkers *can* actually run–another cocktail bar, for instance. Perhaps RB and his partners wouldn’t mind expanding into that market? I dunno. I formed the impression, increasingly, that the Winkers simply wanted to go into any kind of business with RB, to gain his financial backing and the benefit of his experience–understandable–and that RB and his partners were more focussed on finding good business partners of *any* sort than potential restauranteurs. I suppose they already have plenty of restaurants between them. Understandable again, although a little unfortunate that the exercise took place on television within the context of a restaurant-running competition. I still think, though, that Rebecca and Steve were the best qualified to win the competition according to its stated terms i.e. the couple best suited to provide satisfying food in a pleasant environment. Having said that, the standard this year seemed woefully low. I say that knowing and readily acknowledging that I have trouble boiling an egg, but I’m not holding myself up as a person qualified to run a restaurant. Speaking of restaurants, work was pretty exhausting last night: 6.5 hours (6pm to 12.30am) of frantic service without a break. Others had been in much longer than me and they hadn’t had a break either. That’s simply the way it works there. Yes, it’s illegal, but those are the terms and I’m pretty sure they stand on a ‘take it or leave it’ basis. I’m lucky in that if I get fed up I can afford to leave, but it’s bit of an eye opener about the conditions in which some people spend their working lives. Having said that, everybody was cheerful and friendly, and worked happily as a team. I’m still enjoying it. I’m a little daunted at the prospect of just how much busier it’s likely to get in the rest of the week, though, as the holiday comes to a head.